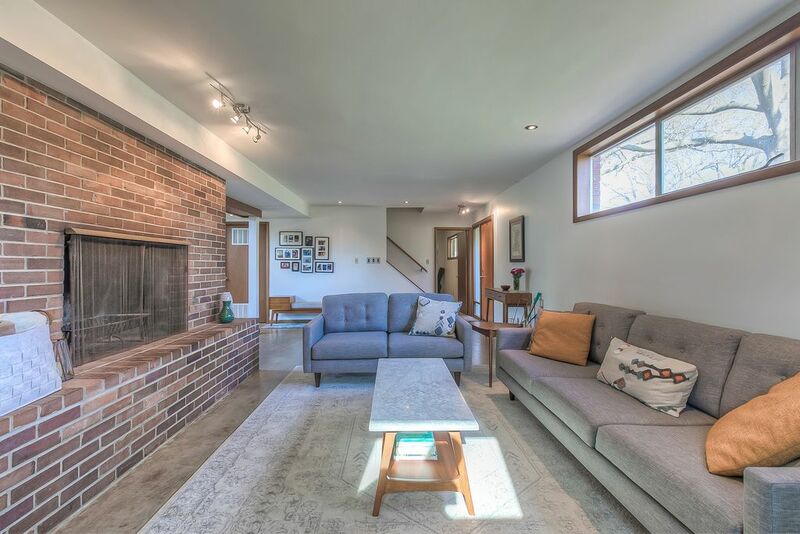 Sarah and her husband knew what to look for when searching for a new home for their growing family: a mid-century house. The focus on open spaces and easy interaction with the outdoors, were specific features they did not want to compromise on. So, a mid-century house was the only option on the table. 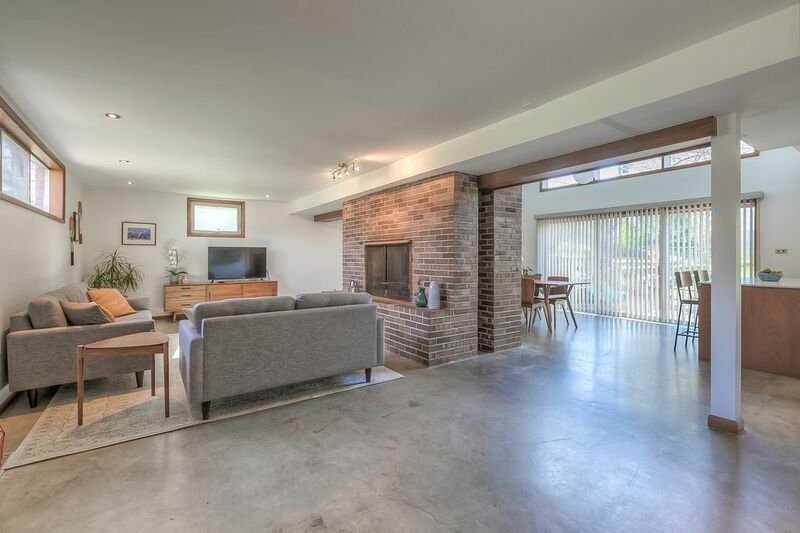 Now, after several years living in the property, the couple have an opportunity to build a custom mid-century style house and have decided to sell their home. Read more below about the property itself, as well as the couple’s journey. 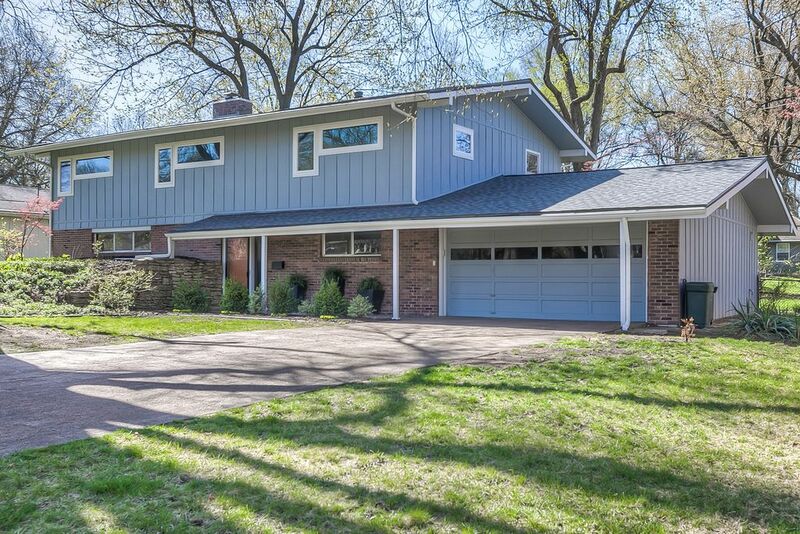 Our first home was a 1925 bungalow in one of Kansas City’s older neighbourhoods. 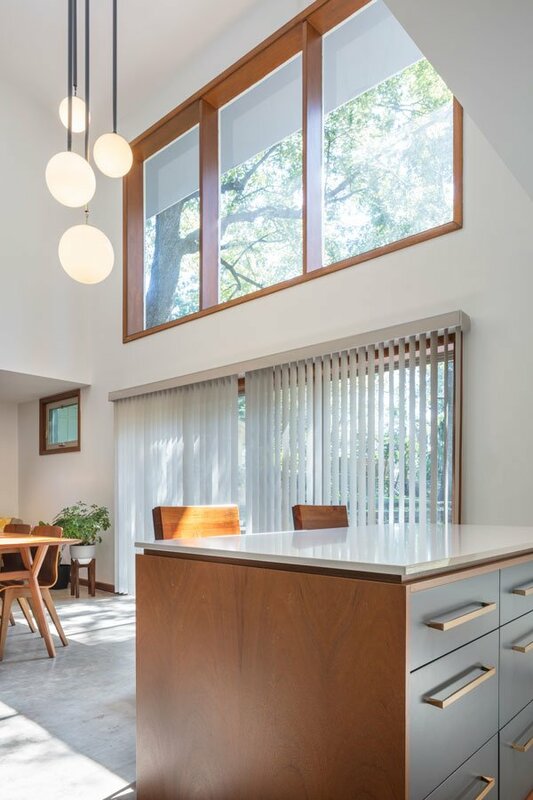 As our family grew, we started to look for our next home, and on a whim, we toured a mid-century home built by the area’s most revered mid-century builder, Don Drummond. From that brief showing, the hook was set on mid-century. We were taken by the inventive floor-plan, the departure from the cluttered, partitioned feel of more traditional architecture, and the timeless, funky aesthetic. 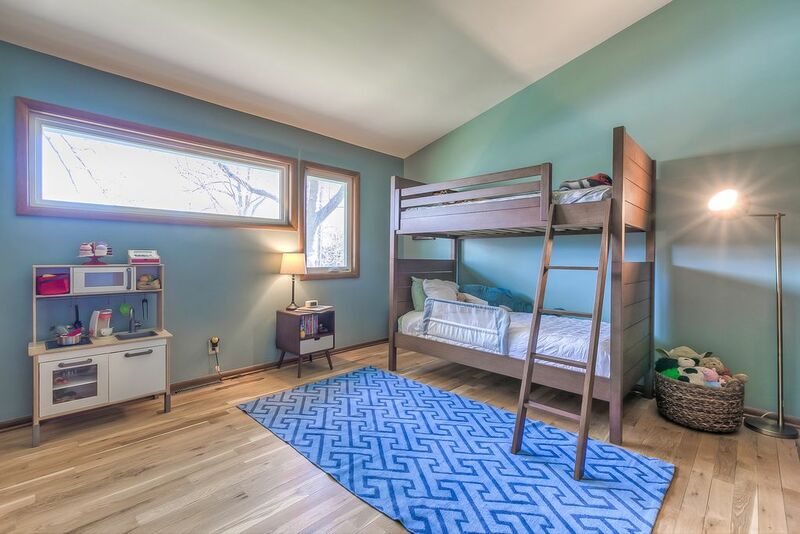 This house was on the market for just a few hours when my husband rushed over to see it. It needed updates, but we both saw the same potential. The house was designed by architect Sam Symons and was his personal residence. What do you think was so special about this period in American design? For us, it represents a re-imagination of at-home living with the emphasis tilted towards communal, public spaces and interaction with the outdoors. It’s that wonderful post-war period when America seemed to relax and have some fun. In the same years, my grandparents built their first home in a new neighbourhood and drank salty dogs on their porch after work with other young couples. Absolutely not. We certainly want to honour the architecture and era of the home, but there are many big-box and boutique retailers that sell furniture and art with a mid-century modern design at all price points. I also really enjoy the hunt for vintage mid-century art and design elements to honour the home and complement our newer furniture. The majority of the house was renovated in 2016. In the original floor plan, the kitchen was divided from the rest of the first floor by a wall of cabinets. That wall was removed, allowing for a much nicer flow and created a wide open entertaining space. The kitchen itself had original GE WonderKitchen metal cabinetry in a dark blue color. We renovated the entire kitchen, but kept the blue color scheme. The new casework is trimmed in mahogany to match the original doors and trim work throughout the home. The concrete flooring on the first floor was sanded and resealed. The upstairs flooring was cork that was in rough shape, so we put down hardwoods. 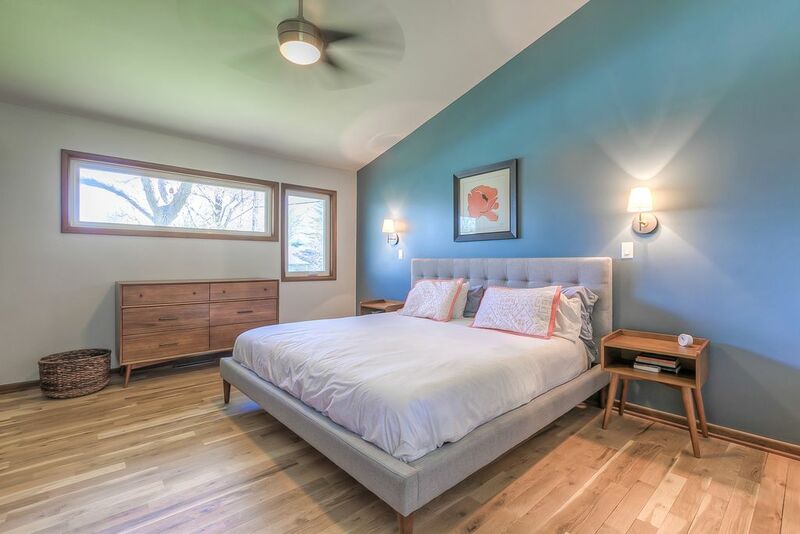 The master bedroom was originally connected to a very small bathroom by a walk-through closet. We reconfigured it to make a much larger and usable master bath. Since our closet space had become our bathroom, custom wardrobes were fabricated for the bedroom. 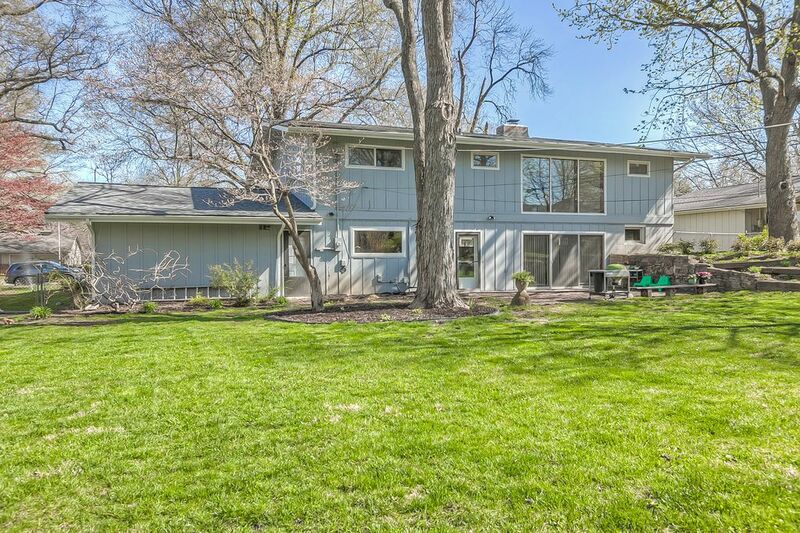 The home does not have a basement, and though there is ample closet space, cabinetry, and a large garage, you don’t have the huge walk-in closets that you find in newer midwestern homes. We actually see this as a huge advantage. The opportunity to declutter and simplify our lives is very attractive to us. The large dining area is certainly the focal point of the home. 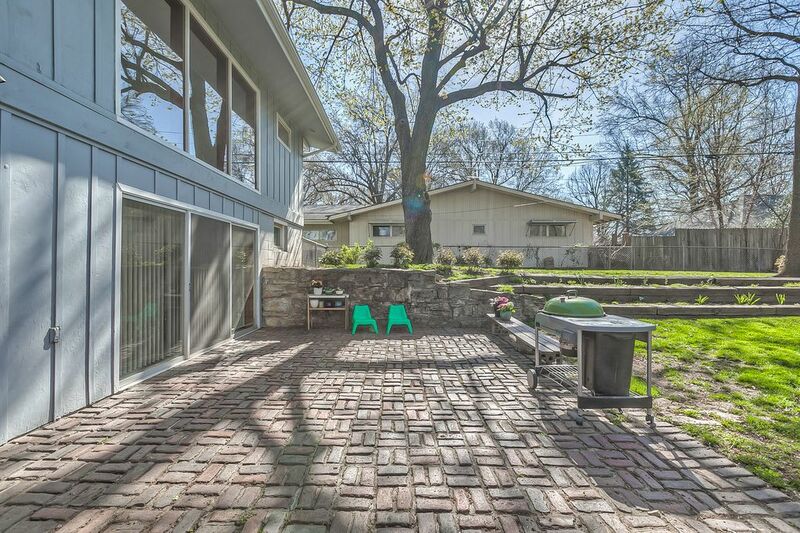 The vaulted atrium feature looks south into the backyard and is flooded with natural light. It is ideal for entertaining and long conversations over family dinner under the globe lamp. 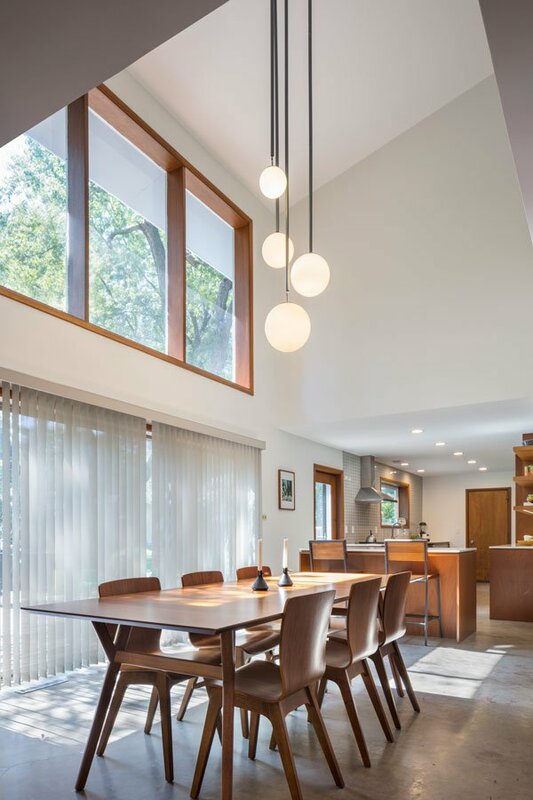 In general, the architecture of that space just lends itself to creating sublime moments, be it breakfast and coffee while bathed in morning light or cocktails in the evening while the kids play in the backyard. The backyard is quite large, flat, and partially shaded. It would be an ideal space for a pool. I think finding the right contractor to perform renovations is absolutely crucial. 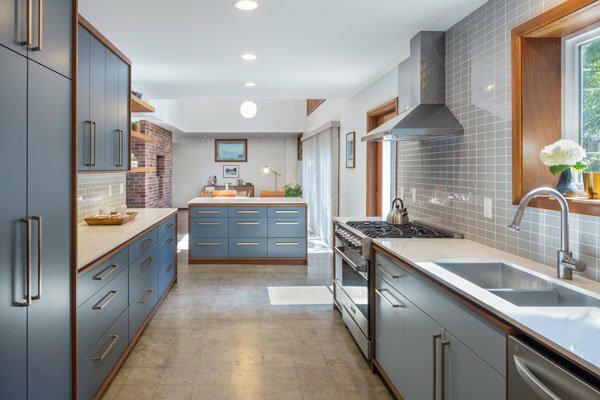 It takes a deft touch to update these properties, and it’s almost tragic when you see a mid-century home with a renovation that looks out of touch with the house. 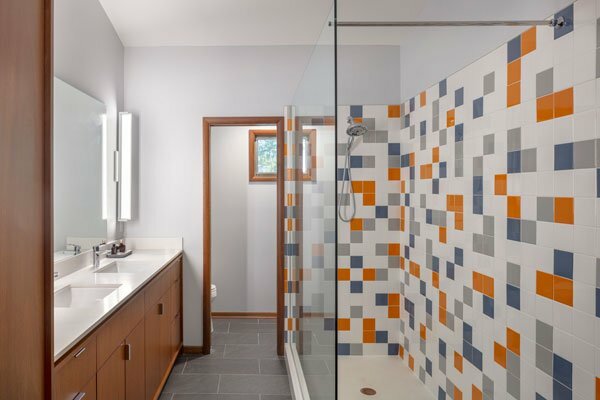 Our renovation was completed by Kansas City design+build firm StudioBuild. 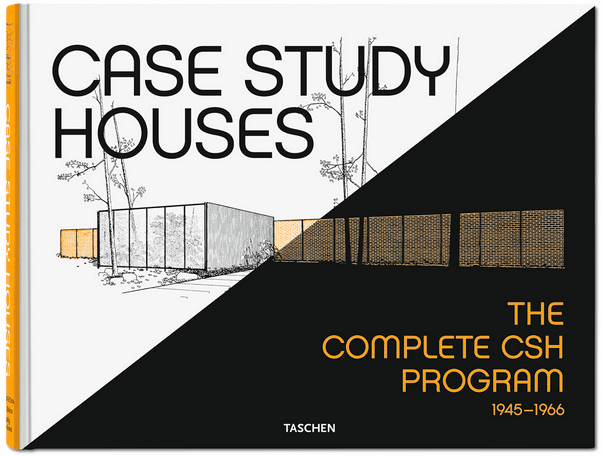 Their ability to modernise mid-century architecture, while having the utmost respect for it, is second to none.